The Founder of Shiatsu, Tokujiro Namikoshi Sensei (right) and his son Toru with Dr. Palmer at the Palmer College of Chiropractic in Iowa. “Shiatsu” is a Japanese word meaning “finger pressure”. It is a “hands-on” therapy used both as a complement to conventional medicine and as a preventative / alternative therapy. – From “The Theory and Practice of Shiatsu” published by the Ministry of Health in Japan, in 1957. Shiatsupractors perform Shiatsu by pressing with their thumbs, fingers and palms on Shiatsu points throughout the body to enhance the body’s natural healing ability and prevent the progression of disease. Shiatsu points are called “Tsubo” in Japanese and their location and the effect of Shiatsu on them is based on an understanding of modern Anatomy and Physiology. These points are effective in treating all body systems including the Integumentary, Muscular, Nervous, Circulatory, Skeletal, Endocrine, and Digestive systems. They are applicable only to Shiatsu Therapy and are not related to ancient “Chinese Meridians” for Acupuncture, Moxibustion or Anma therapy. The Japanese expression “Shindan Soku Chiryo” means “Diagnosis and Therapy Combined” and is the essence of Shiatsu. The thumbs, fingers and palms of trained and experienced Shiatsupractors are sensitive enough to detect, on contact, irregularities in the skin, muscles or body temperature. Relating to the Cutaneovisceral Reflexes in the course of practical experience, Shiatsupractors are able to locate abnormalities and ascertain their degree, as well as determining the condition of the organs. When detecting abnormalities, Shiatsupractors apply Shiatsu as a treatment at the same time. The amount of pressure and its tempo are gauged to apply the appropriate pressure for each patient – sometimes strong or soft – quick or slow. Lacking the sensitivity of the hand, knuckles, elbows, knees and feet are not used for application of pressure during treatments by Shiatsupractors. Mastering the essence of Shiatsu requires many years of practical experience and is the goal of a Shiatsupractor. He was the founder of Shiatsu massage therapy. His mother suffered from rheumatism and, as a young boy of seven, he used his bare hands to heal her. With this experience as a base, he created the Shiatsu method of healing. He gave treatment to countless thousands of people, including many active Japanese Prime Ministers, and also to foreign visitors such as Marilyn Monroe and Muhammad Ali. Meanwhile, he established the Japan Shiatsu College and educated many world famous Shiatsu practitioners, instructors and authors, including Shizuto Masunaga, who wrote “Zen-Shiatsu”, Kensen Saito, who wrote “Shiatsu Doh”, Ryokyu Endo, who wrote “Tao Shiatsu” and Kiyoshi Ikenaga, who is the author of “Tsubo Shiatsu”. Namikoshi Sensei also founded the Japan Shiatsu Association and the International Shiatsu Association. Kiyoshi Ikenaga, was born in Tokyo Japan in 1966. He is a Licensed Shiatsu Practitioner by the Ministry of Health in Japan and a Registered International Shiatsu Instructor with the International Shiatsu Association. He graduated from the Japan Shiatsu College in 1986 and studied Shiatsu directly from Tokujiro Namikoshi sensei. He moved to Toronto, Canada in 1996 and taught Shiatsu at the Shiatsu Academy of Tokyo Toronto. In 1998, Kiyoshi established the Canadian College of Shiatsu Therapy in North Vancouver BC Canada. He is also the founder of the Canadian Shiatsu Society of BC. Tokujiro Namikoshi Sensei, the Founder of Shiatsu Massage Therapy, was born November 3rd, 1905 in Kagawa prefecture on Shikoku Island, Japan. When he was 7 years old, his family moved to Hokkaido where the weather was cold and harsh. His mother “Masa” developed rheumatoid arthritis as a result of hard physical labour and the change from a warm to a cold, damp climate. There was no doctor or medicine available due to the isolation. Tokujiro, only 7 years of age, tried to ease his mother’s pain. He discovered that she felt better when he pressed on her body with his thumbs, rather than stroking or rubbing. He concentrated his pressure on points which he found on the cervical region of her spine as well as the middle and lower back. As he applied himself, he also learned the relationship between the Adrenal glands and rheumatism. Eventually Masa’s rheumatoid arthritis was cured by Tokujiro’s treatment. She lived in good health to be 88 years of age. From his study and practice he subsequently developed a scientific anatomical and physiological theory which explained his treatment. This unique Japanese hands-on therapy, he called “SHIATSU” (meaning thumb and finger pressure in Japanese). He then opened his Shiatsu clinic in Sapporo in 1925 and in Tokyo in 1933. 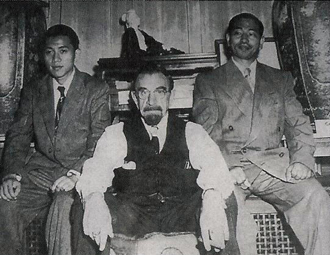 In 1953, he was invited to introduce his Shiatsu at the Palmer Chiropractic School in Iowa, U.S.A. There he developed a good relationship with Dr. B.J. Palmer who was a founder of Chiropractic. Toru Namikoshi Sensei, who is a son of Tokujiro, stayed at the Palmer Chiropractic School for 7 years to study and compare Shiatsu and Chiropractic. After he returned to Japan from the U.S., he contributed to the development of Shiatsu Therapy based on modern Anatomy and Physiology. In 1940, Tokujiro established his school, the Japan Shiatsu College in Tokyo, and began to train Shiatsupractor’s Shiatsu Practitioners. This was the first Training school in the world for Shiatsupractor’s Shiatsu Practitioners. In 1955, the Japan Shiatsu College was officially licensed by the Ministry of Health in Japan. At present, the 3 year Registered Shiatsu Therapist program requires students to be in full attendance for 2500 hours. Upon successful completion of the program the students are eligible to take the government examination. In fact, there is only one type of Shiatsu Massage Therapy in the world today, the original Japanese Shiatsu Therapy of Namikoshi Sensei, but there are many derivatives. The most popular and best know of these derivatives is Zen-Shiatsu developed by Shizuto Masunaga Sensei. He graduated from the Japan Shiatsu College in 1958 and devised his style of Shiatsu based on the Chinese Meridians. It is known around the world. In 1955, Shiatsu Therapy was first authorized by the Ministry of Health in Japan. At that time the Ministry mistakenly assumed that Shiatsu and Western massage were partially Anma, a type of Acupressure massage from ancient China. In 1964, The Ministry of Health in Japan realized that Japanese Shiatsu and Western massage didn’t belong to Traditional Chinese Medicine and amended the law so that Anma from China, Shiatsu from Japan and Massage from the West were all realized as different and unique therapies. Finally, Shiatsu Therapy obtained legal acknowledgement as a unique therapy. Today, the Ministry of Health in Japan authorizes Acupuncture, Moxibustion, Anma, Massage and Shiatsu as “Alternative Therapies” which it regulates under the license system. This licensing system has promoted a misunderstanding that Shiatsu belongs to traditional Chinese Medicine. This is because the Japanese Ministry of Health considers Japanese Shiatsu, Western Massage and Anma, (all hands on therapies) to be in one category, As such, they all come under one license. Practitioners are required to pass government exams. Every student in Japan who wants to become a Shiatsu Practitioners or a Registered Massage Therapist must learn the Chinese Meridians to pass the examination. Students who pass are officially called an “Anma, Massage and Shiatsu Practitioners”. Although the word “Shiatsu” is originally Japanese, its meaning has come to be understood in English speaking counties and throughout the world.